Shop for authentic replica French Fleur De Lis flags. Our French Fleur De Lis flags are constructed of durable nylon with a canvas heading and offered in five sizes. The French Fleur de Lis Flag has huge significance in France itself and in other parts of the world, including the Americas. It consists of three fleurs de lis emblems on a deep blue background. The flag carries the traditional French Fleur de Lis, tripled to represent the Holy Trinity. It was carried by French armies as they gained colonies in the New World. The Fleur de Lis itself is a stylized lily. For much of its history, France was a Roman Catholic country. Although modern day France is a single entity, during its history it consisted of many kingdoms and provinces. All of these, however, were united by their Catholic Faith. The lily is a symbol of purity, and was adopted by the French royal family during the Middle Ages. 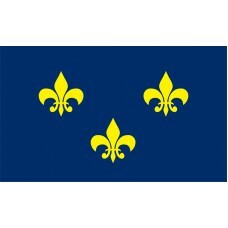 The triple lily design of the French Fleur de Lis Flag was introduced by Charles V in the 14th Century. Charles was the head of the House of Valois, which ruled those parts of France not controlled by other countries, such as England. At his Coronation in 1364, France was embroiled with England in the Hundred Years War. Charles adopted and tripled the Fleur de Lis to inspire his troops. The Fleur de Lis is associated with many French saints, especially Saint Joseph. Knowing of its deep religious significance, Charles V employed it to great effect. He was a very successful monarch, scoring significant victories against England and regaining much French territory. After his death, Charles V was held in high esteem by future generations, and his triple Fleur de Lis flag was carried proudly by French explorers in the New World. During the 16th and 17th Centuries, France continued competing with England and other European powers to acquire colonial territories across the world. Where they were successful, the Fleur de Lis Flag became associated with their conquests. 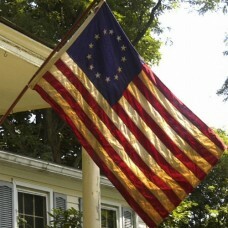 In certain provinces and cities in North America, the Fleur de Lis Flag is still flown proudly. New Orleans in particular is associated with the Fleur de Lis. It is the emblem of the New Orleans Saints football team, and has gained in popularity in the city since Hurricane Katrina. Since 2008, the Fleur de Lis has been an officially recognized symbol of the state of Louisiana. The Fleur de Lis also appears on the Canadian national coat of arms, and the provincial flags of Nova Scotia and Quebec. French influence in the establishment of cities and towns mean the design can be found on municipal flags and coats of arms. These include Detroit, Louisville, and St. Louis. As France played a big part in the formation of both Canada and the United States of America, the Fleur de Lis flag retains significance in many parts of the continent. Although seen by some as a reminder of past colonial settlers, for many it provides a sign of identity and continuity. With origins in medieval Europe, the French Fleur de Lis flag remains important to this day.